Jack led the project and we got a dream-team of past collaborators to work with on it: Phil Gyford, who had already done loads of thoughtful designing of new reading experiences for the Guardian with his ‘Today’s Guardian‘ project, and brilliant designer James King who we had worked with previously on the Here & There Maps. Faces come up in News articles a lot, editors exercise artistry in picking photos of politicians or public figures at their most desperate. Subjects caught glancing in the wrong direction or grimacing are used to great effect and drama alongside headlines. 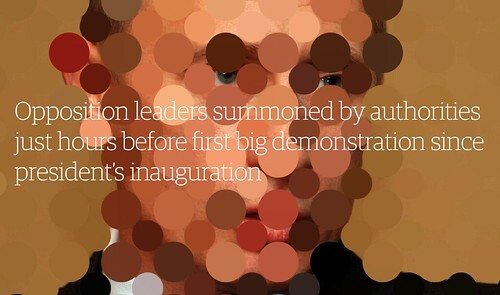 Headliner makes use of face detection to highlight the eyes in news photographs. It adds a second lens to the existing photo, dramatising and exaggerating the subject. 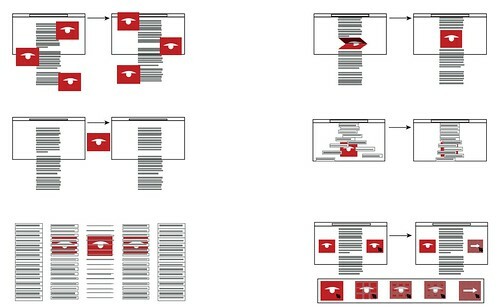 It allows audiences to read more meaning into the headline and context. Graphically Headliner departs from the graphic rules and constraints news has inherited from print. It references the domain’s aesthetic through typography but adopts a set of behaviours and structures only available in browsers and on the web. 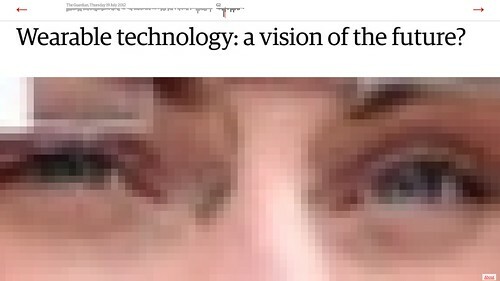 We wanted to retain much of what makes Today’s Guardian a good reading experience but find more in the text and images that we could use to make it less dry. 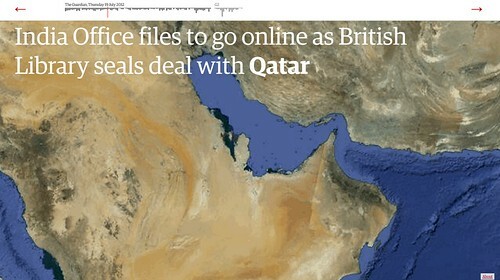 We decided to rely solely on the material we can get from the Guardian’s API, alongside other free services and software. We looked at various ways of extracting useful data from the text of articles. It had been some years since I’d last dabbled with term extraction and I was surprised that it didn’t seem wildly better than I remembered. We settled on using the free Calais API to pull useful terms out of articles, but it’s quite hit and miss — some places and peoples’ names that seem obvious to us are missed, and other words are erroneously identified as significant. But it gave us a little something extra which we could use to treat text, and also to guess at what an article was about: we could guess whether an article was focused on a person or a place, for example. Unfortunately for us Face.com were bought by Facebook and promptly announced the imminent closure of their API. We replaced it with OpenCV using Python, which is trickier, and we don’t yet have it working quite as well as Face.com’s detection did, but it’s a good, free, alternative under our control. If we didn’t have any detected eyes to use, we didn’t only want to enlarge the supplied photo — we wanted some variety and to use more of the data we’d extracted from the text. So, if we’d determined that the article was probably focused on a place, we used Google’s Static Maps API to display a satellite image centred on the location Calais had identified. We put all that together with a front-end based, for speed, on the original Today’s Guardian code, but heavily tweaked. We make images as big as we possibly can — take advantage of that huge monitor! — and enlarge the headlines (with the help of FitText) to make the whole thing more colourful and lively, and an interesting browsing experience. To start with, we were most interested in how we might integrate advertisements more closely into the fabric of the news itself. 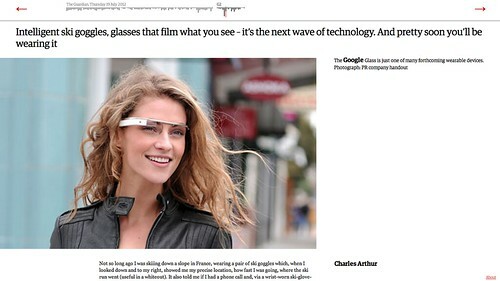 Directing the readers attention towards advertising is a tricky problem to deal with. One of the more fanciful ideas we came up with was to integrate eye-tracking into the newspaper (with support for webcams) so that it would respond to your gaze and serve up contextually relevant ads based on what you were reading at any particular moment. This idea didn’t get much further than a brief feasibility discussion with Phil who determined that, given the tight deadline, building this would be unlikely! What did survive however, was the idea that the newspaper looks back at you. Eyes are always interesting. 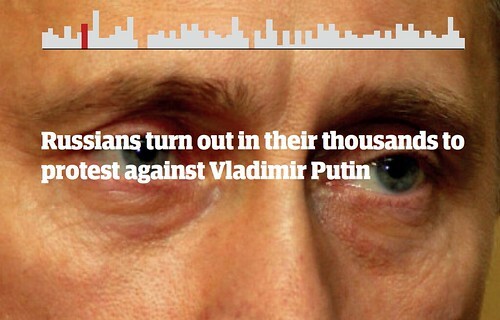 Early on, we experimented with cropping a news photo closely around the eyes and presenting it alongside a headline. This had quite a dramatic effect. 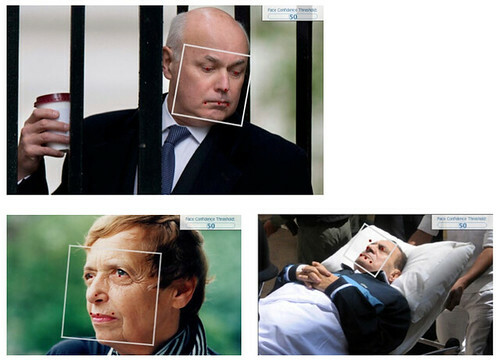 In the same way that a news headline can often grab the attention but remain ambiguous, these “eye crops” of news photos could convey emotion but not the whole story. Who the eyes belong to, where the photo is taken and other details remain hidden. In the same way that we were summarising the image, we thought about summarising the story, to see if we could boil a long story down to a digestible 500 words. So we investigated some auto-summarising tools only to find that they didn’t do such a good job of selecting the essence of a story. Perhaps they take a lot of customisation, or need to be trained with the the right vocabulary, but often the output would be comical or nonsensical. We did discover that Open Calais did a reasonably reliable job of selecting phrases within text and guessing whether it referred to a person, a place, an organisation etc. While we felt that Open Calais wasn’t good enough to draw inferences from the article, we felt we could use it to emphasising important phrases in the headlines and standfirsts. Typographically, it made sense to use Guardian Egyptian for the headlines, although we did explore some other alternatives such as Carter One – a lovely script face available as a free Google font. Headliner was a two-week experiment to explore the graphic possibilities of machine-learning and computer vision applied to content. Not everything works all the time, it’s a prototype after all – but it hints at some interesting directions for new types of visual presentation where designers, photo editors and writers work with algorithms as part of their creative toolbox. Matt J was busy running Papercamp last Saturday. One of my favourite things to emerge from the day was Basil Safwat’s Processing.A4. 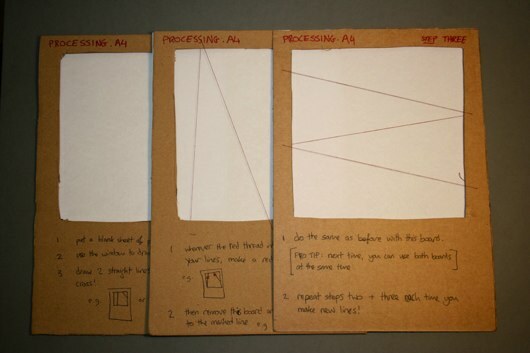 It’s computational cardboard; you follow the instructions on it to replicate the output of the Substrate Processing script. Troika have launched their new artwork, Shoal, in Toronto. Spanning across a 50 meter long corridor, 467 fish-like objects wrapped in iridescent colours and suspended from the ceiling rotate rhythmically around their own axis to display the movements and interdependency typical to school of fish. My workshop is located in an old storefront with a big window facing towards the street. In an attempt to create more privacy inside, I’ve decided to install a small but smart curtain in that window. The curtain is smaller than the window, but an additional surveillance camera and an old laptop provide it with intelligence: The computer sees the pedestrians and locates them. With a motor attached, it positions the curtain exactly where the pedestrians are. I really enjoyed his video of it – first, the project displayed-as-is, and then a detailed explanation of what the computer’s “seeing”. Through both parts, the hilarity of the little, jerkily moving curtain is not lost. The emphasis is added to highlight the goal of all data visualization; to present an audience with simple small truth about whatever the data are measuring. That felt like a nice addition to some of the topics covered in Matt J’s talk at citycamp and my own talk on data from a few weeks ago – but do read the whole post; it’s an insightful piece of writing. Finally, some stop-motion animation. Our friends Timo Arnall and Matt Cottam recently linked to the videos some of their students at the Umeå Institue of Design produced during their week working on stop-motion techniques. They’re all charming; it’s hard to single any of them out – they’re all lovely – but the dancing radio (above) was a particular favourite. SVK shutting up shop sale!